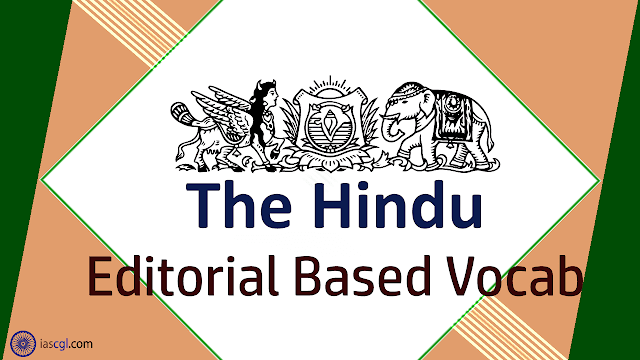 HomeVocabThe Hindu Vocab 10th September 2018 For Competitive Exams. The Hindu Vocab 10th September 2018 For Competitive Exams. Vocabulary from The Hindu Editorial 10th September 2018 for Staff Selection Commission(SSC) Combined Graduate Level, Combined Higher Secondary Level, Bank PO, Clerk and other state Government Examination. A few years ago, when I asked my father to recommend a judgment of the Supreme Court for me to read, he mentioned the CIT v. T.N. Aravinda Reddy (1979) case. Authored by Justice V.R. Krishna Iyer, the judgment is pure art. It is about two pages long and is prose that flirts with poetry. Take, for instance, the following: “The signification of a word of plural semantic shades may, in a given text, depend on the pressure of the context or other indicia. Absent such compelling mutation of sense, the speech of the lay is also the language of the law.” Thus, hundreds of pages in textbooks on the principles of statutory interpretation are magically reduced to two sentences. The felicity in his expression and the beauty of his language won me over. His writings proved that clarity and precision in the language need not always come at the cost of linguistic romance. With his masterful articulation, Iyer shined light on parts of the law and the world that were hidden in plain sight. This endeavour, it would appear, was the motive that pushed him to the literary heights that he reached. This judgment is like a scripture to me in that every time I read it, I see something new. Had my father suggested any judgment other than this one, my language and perhaps my life would probably have been different. Even today, I often speak a sentence and wonder whether I could have framed it better. To the critics of his style, D.A. Desai said of Iyer’s language, “It is not the language of those who praise simplicity in language on account of their inability to enjoy the vast expanse of the English dictionary.” Professor Richard Field of the Harvard Law School condoned the linguistic adventurism of Felix Frankfurter, as Associate Justice of the United States Supreme Court, when he said, “We don’t decry the vivid phrase,/ The erudite bravura,/ That give judicial mayonnaise/ A touch of Angostura.” Justice Michael Kirby of the Australian High Court described Iyer as “a poet writing in prose.” I cannot agree, for Iyer did not write his judgments, he composed them. For all this and more, he is my favourite English-man. Semantic: अर्थ - relating to meaning in language or logic. Indicia: संकेत- signs, indications, or distinguishing marks. Compelling: सम्मोहक -evoking interest, attention, or admiration in a powerfully irresistible way. Mutation: परिवर्तन - the action or process of mutating. Embellishments: अलंकरण - a decorative detail or feature added to something to make it more attractive. Reprimand: डांटना -a rebuke, especially an official one. Blist: छाला -a small bubble on the skin filled with serum and caused by friction, burning, or other damage. Felicity: परम सुख -intense happiness. Condoned: माफ़ -accept and allow (behavior that is considered morally wrong or offensive) to continue. Decry: दोष देना -publicly denounce. Vivid: ज्वलंत - powerful feelings or strong, clear images in the mind. Mayonnaise: एक व्यंजन जिसे अंडो, तेल मलाई और सिरके के साथ परसा जाता है। -A dish which is served with eggs, oil cream and vinegar.